We are used to year-round supermarket availability of everything, but fresh produce really is tastier when eaten at the right time of year. Less storage time also means more vitamins. So eating with the seasons is definitely worth the effort. 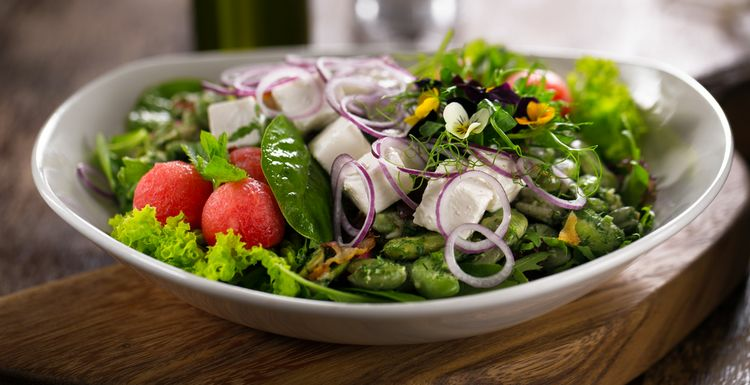 This colourful salad uses seasonal ingredients and is based around broad beans. These and other legumes are a great source of muscle-building protein. The vinaigrette dressing gives you the benefits of olive oil and adds extra flavour. Tomatoes and cucumber add more antioxidants and vitamins, and the feta cheese gives a further protein top up. Meat eaters can add a rasher or two of fried bacon to the mix – cook this at step 3. Place the broad beans in a bowl and cover with boiling water. Leave for a minute or two and then drain and tip into cold water. Squeeze off the skins and discard. Drain the prepared beans and place in the serving bowl. Heat a small amount of cooking oil, then stir fry the onion and garlic until softened. Add the tomato and stir fry for another minute, just enough to cook lightly. Add these ingredients to the beans and toss together. Add the cucumber and feta cheese. For the dressing, wash and chop the mint leaves. Then simply mix up the olive oil and white wine vinegar, add the mint and a pinch of pepper. Dress the salad to taste and enjoy. I tried it with cooked defrosted frozen broad beans (if that makes sense) and yes it works. Very tasty too! I was given some some broad beans from a neighbour and used them in a salad last week, which was delicious. I had never used them in salad before either, and it was her recommendation, and was similar to this salad, but with stilton rather than feta. Any salad with feta cheese is delicious. I have never thought of using broad beans in a salad though I wonder if I can just use frozen defrosted ones?